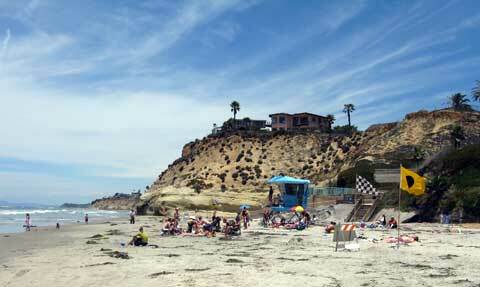 Visit Fletcher Cove, the Best Beach in Solana Beach, California. This small family-friendly beach park was recently renovated. The upper level is a grassy park, playground and basketball court. Walk down the ramp to the beach and you will find a small cove that is plenty big at low to medium tide for the local crowds and tourists in the nearby Solana Beach rentals. Solana Beach, California is a charming beach town in San Diego North County, sandwiched between Cardiff to the north and Del Mar to the south. 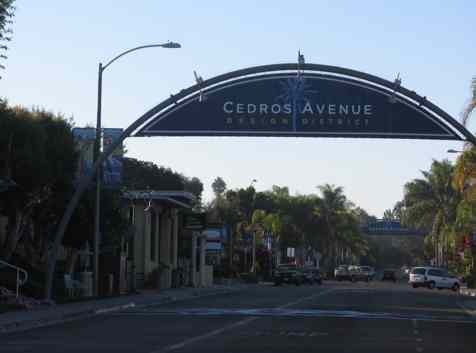 This quiet town is known locally for the Cedros Design shopping district and the Solana Beach Belly Up Tavern. Location: Pacific Ocean at the end of Lomas Santa Fe Drive in Solana Beach, Cal. Parking: Free parking in small parking lot at Fletcher Cove park, free street parking, and free parking in the public parking lot across from the post office. Getting There: Short walk to the park, playground and basketball court from parking areas. To access the beach, you need to descend a steep but short ramp to the cove. Best Restaurants in Solana Beach CA - You can walk to the Naked Cafe for healthy sandwiches. For some of the best pizza and pasta, try pizza Nova (945 Lomas Santa Fe Dr. 858 259-0666). For some local food, try Sam's Place (141 Lomas Santa Fe Dr 858 755-3415) for a fun menu ranging from fish and chips to Mediterranean cuisine. And for the best Mexican restaurants, try Fidels or Tony's. High Tide Access: This tiny cove can be completely inaccessible at high tide, but is quite nice at moderate to low tides. At low tide of 1 foot MLLW or less, you can walk north or south along the narrow beach and explore some of the smaller hidden beaches in Solana Beach. If you plan to spend some time at Fletcher Cove Solana Beach, definitely check out our San Diego Tide Chart to help plan your visit. Disability Access: Some disabled parking and access to upper park. Ramp is steep to beach so no recommended. Hazards: Rip currents, unstable bluffs along narrow beach to north and south. 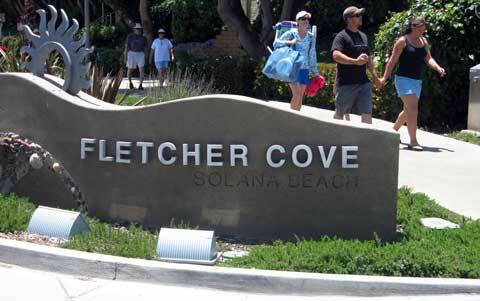 Fletcher Cove is the most popular beach in Solana Beach. 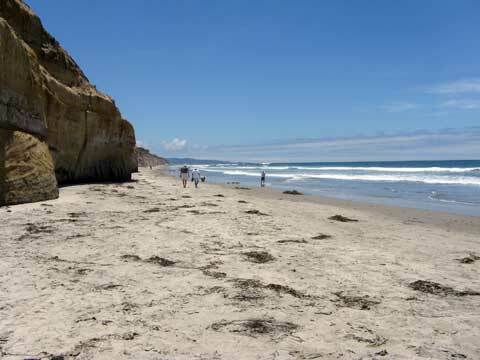 Smaller beaches in Solana Beach that are easy to miss include Tide Beach at the north end, with some tide pools to explore; Seascape Beach, just south of Fletcher's Cove, and Del Mar Shores on the north side of the San Dieguito river mouth. These beaches are small and difficult to access at high tide, but at very low tide you can walk to these beaches from Fletchers Cove. The Solana Beach Cedros Design District is a popular shopping district in Solana Beach, with unique high-end shops. It is located 2 blocks from Fletcher Cove beach. Fletcher Cove Solana Beach Driving Directions - From Interstate 5 in Solana Beach (north of Del Mar), go west on Lomas Santa Fe Drive to the Pacific Ocean. There is a small free parking lot at the beach park, a larger free parking lot the the left across from the post office, or free street parking. Directions to Fletcher Cove By Train - You can easily reach Fletcher Cove Solana Beach from the San Diego Coaster Train or Amtrak. 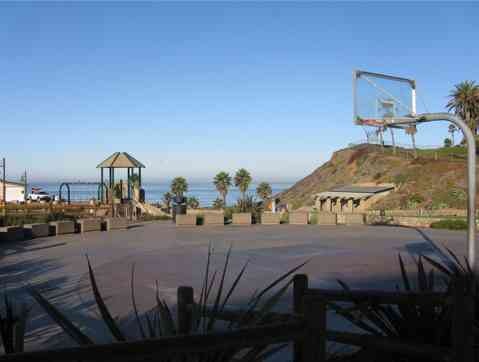 It is 4 blocks from the Solana Beach train station and transit center. 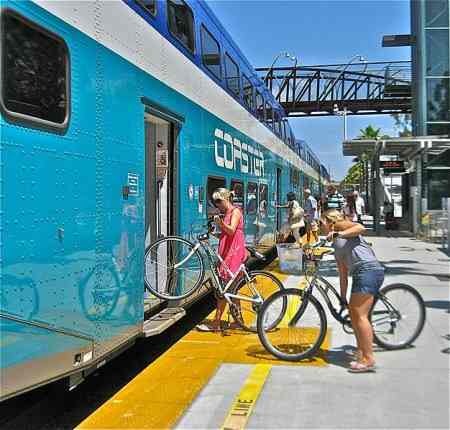 You can also bring your bicycle on the Coaster train, and bike along the Rail Trail or highway 101. Note: trains have limited service on Saturday, Sunday and holidays, currently only 4 trains a day, so be sure to check the train schedule.